We seem to be entering a phase of intellectual horror films, following the extremely visceral style of the last decade. Suddenly movies with psychological depth are succeeding over the generic spectacle, so that we have movies like The Witch, The Babadook, Goodnight Mommy, and The Neon Demon replacing the days of endless Saw sequels. The Wailing is South Korea’s answer to these films, distinct in its national style by the sense of humor and in many ways it the country’s own take on a masterpiece like The Exorcist. Steeped in atmospheric dread, The Wailing begins with a series of unexplained crimes in a tiny rural village. Detective Jong-Goo (Do Won Kwak) is awoken early one morning to report to a crime scene, assuming it to be death by natural causes. He is shocked to discover a brutal murder scene, with a catatonic culprit taking on an unearthly appearance. When one murder scene turns into another as the townsfolk inexplicably begin murdering each other, it quickly becomes apparent that something strange is happening in the typically quiet village. There is a pattern occurring in the behavior of those who eventually become violent, and many point to the arrival of a Japanese stranger (Jun Kunimura) as the cause of suffering. At first Jong-Goo dismisses this theory, but he has a different response when his young daughter begins to show the same symptoms as the other killers. The irony of the character of Jong-Goo is that he is incompetent in nearly all that he does, despite his noble intentions. In trying to solve the mystery of his daughter’s ailment, he is often obtuse and cowardly. At first this is rather comedic, especially as he is seen to panic at the sight of danger, but it slowly turns tragic. In an effort to seek spiritual healing for his daughter, Jong-Goo hires a shaman (Jeong-min Hwang) to perform exorcism rituals. These rituals provide the film with some of the most expertise filmmaking, in many different ways. Even if I often had no idea what was actually happening, I was captured by the cinematography, the acting, and especially the editing. I sat in rapt attention, captivated by the filmmaking in a way that engaged me for the rest of the narrative, despite a boldly padded run-time of 157-minutes. Towards the end of the movie there are many twists and turns, and revelations which only make sense upon post-viewing analysis. This is not mindless spectacle, even if the film does end on a high note of subtle special effects. More important than the moments of gore and horrific imagery are the deeper ideas of faith and the battle between good an evil. This is the stuff of nightmares, though it is a dream for true fans of the horror genre. 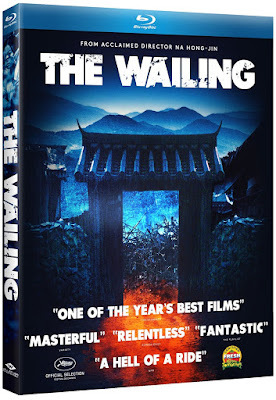 The Blu-ray release of The Wailing includes a few special features. There is a making-of featurette that is under 5-minutes long, as well as a 2-minute promotional video and the trailer. The real reason for this Blu-ray is the film itself, which is enhanced by the atmosphere of the spectacular cinematography and sound design. This is also a film where the horror is often contained in the face of the actors rather than the gore, though there are a few particularly bloody sequences within the film. Both are enhanced by the high definition presentation, regardless of how lackluster the special features are.